Page load speed is becoming one of the fundamentals of the usable web. Users become more and more demanding and the web has a tendency to change from complexity to speed and simplicity. That&apos;s why it is essential to check your web load speed, optimize it and identify weak spots. The page load speed also affects SEO. If the page is not loaded fast enough, the user leaves it and returns to the search results, which can have a negative impact on your rankings. You will use Miner Page Speed especially for bulk checking of the load speed for URLs on your site, which makes it easier and faster to identify weaknesses. 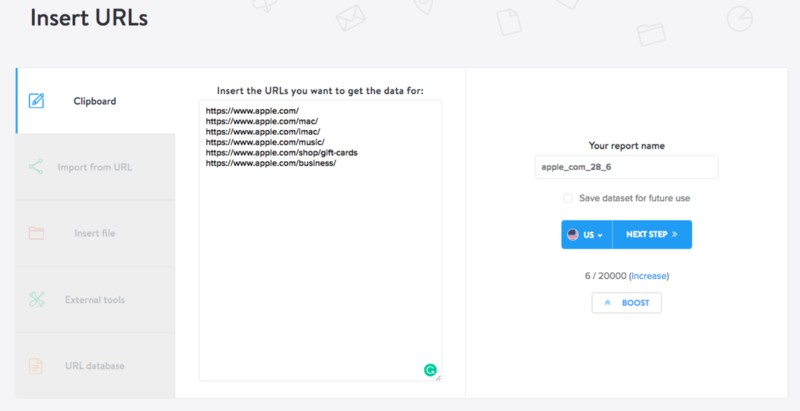 Get started by clicking on Create report button and specifying URLs at the input. Then write or copy the dataset of the URLs for which you want to check load speed. In the URL Analysis section, click on Miner Page Speed. After clicking, you can choose which data you want to get from Miner. 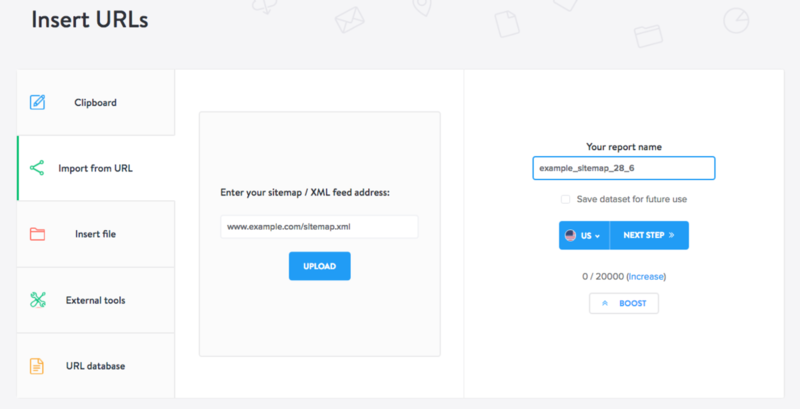 PageSpeed: Checks data about page load speed, server response time, size of sources and many more. 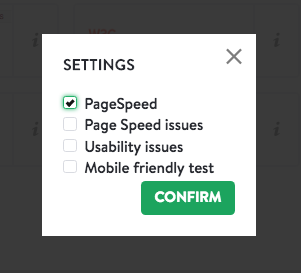 PageSpeed Issues: Identifies weak spots and suggests, which problems should be solved. Usability Issues: Identifies weak spots in web usability. Mobile friendly test: Test, whether a page is optimized for mobile devices. Select the options you are interested in and click Confirm. Then click on Get Data to start processing your inputs. 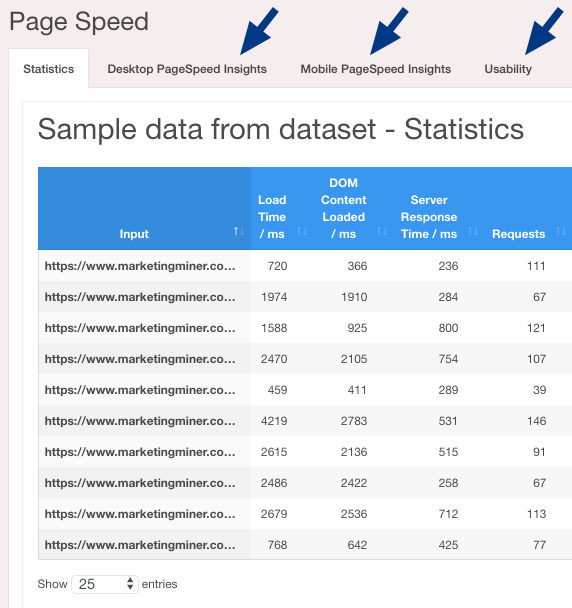 The output report shows, among other things, understandable graphs and average values to help you make a general view of the page loading speed and usability. The report is also divided into several tabs. Depending on what you chose at the input, you should see at least one and up to four tabs. You can then switch between them. Load Time: Load time of a page in ms.
DOM Content Loaded: DOM load time in ms.
Server Response: Response time of server in ms.
Requests: Number of requests sent when loading the page. Redirected Requests: Number of requests that were redirected (which creates unnecessary delay). Error Requests: Number of requests reffer to non-existent sources. Requested Domains: Number of various domains, where the requests went to. Image Size: Total size of images when loading a page. CSS Size: Total CSS source size when loading a page. HTML Size: Size of HTML in case it&apos;s stated in Content-length. Other Size: Total size of other loaded sources, like videos. First Biggest Request: First biggest source when loading a page. Second Biggest Request: Second biggest source when loading a page. Third Biggest Request: Third biggest source when loading a page. Desktop PageSpeed score: PageSpeed Score according to PageSpeed Insights. AvoidLandingPageRedirects: There are unnecessary redirects on the page (more info). EnableGzipCompression: Web uses Gzip compression (more info). LeverageBrowserCaching: Web uses source caching correctly (more info). MainResourceServerResponseTime: Server response is sufficiently fast (more info). MinifyCss: URL uses minified CSS sources (more info). MinifyHTML: URL uses minified HTML (more info). MinimizeRenderBlockingResources: URL efficiently loads sources in a way that a user can see the content as soon as possible (more info). OptimizeImages: URL uses optimized images (more info). PrioritizeVisibleContent: Detects, whether bigger sources are necessary to load a content above the fold and whether that causes its loading to slow down (more info). Mobile PageSpeed score: PageSpeed Score according to PageSpeed Insights. Mobile_friendly: Identification, whether URL is usable in mobile devices as well. M_AvoidLandingPageRedirects: There are unnecessary redirects on the page (more info). M_EnableGzipCompression: Web uses Gzip compression (more info). M_LeverageBrowserCaching: Web uses source caching correctly (more info). M_MainResourceServerResponseTime: Server response is sufficiently fast (more info). M_MinifyCss: URL uses minified CSS sources (more info). M_MinifyHTML: URL uses minified HTML (more info). M_MinimizeRenderBlockingResources: URL efficiently loads sources in a way that a user can see the content as soon as possible (more info). M_OptimizeImages: URL uses optimized images (more info). M_PrioritizeVisibleContent: Detects, whether bigger sources are necessary to load a content above the fold and whether that causes its loading to slow down (more info). AvoidPlugins / M_AvoidPlugins: Detection of loading of web plugins (Flash, Silverlight), which is usually better to avoid (more info). ConfigureViewport / M_ConfigureViewport: Detection, whether a viewport for various devices is configured correctly (more info). SizeContentToViewport / M_SizeContentToViewport: Detection, whether the content on various devices is still accessible without horizontal scrolling (more info). SizeTapTargetsAppropriately / M_SizeTapTargetsAppropriately: Audit of usability of elements according to their size on various devices (more info). Focus mainly on page load time and response time. The lower the number, the better for you. The green color indicates the page load time less than 1.1 seconds, which is a great result. The yellow color indicates the time between 1.1 and 2.5 seconds, which is worse, but it is still not critical. In the case of red color, you should resolve the problem as soon as possible, because this means that loading time is more than 2.5 seconds, which indicates a quite big problem. If you are kind of lost in the output report, don&apos;t worry. Most of this information is for developers and not for marketers. As a marketer, you should make an overall evaluation of the status of the page load speed, and if the results are not very convenient, you should forward a report to the development department.